Not particularly up to date with this one (first published in 2005), but I’m about to read the more recent follow up Mind Over Ship and thought I’d pop my thoughts on the preceding novel here. Actually, as far as I’m aware it’s never actually been properly published here in the UK; it’s, with the internet, easy enough to get your hands on, naturally, but maybe not everyone has heard of it. 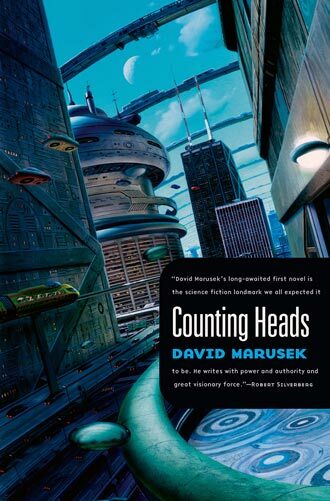 Counting Heads, Marusek’s debut novel, is an excellent read. In some ways it’s straightforward enough, it follows the fortunes of one man and his family through several decades (though, to be clear, it leaps – overall there is a broad sweep, but it’s handled in a couple of denser “chunks.”) Where it sets itself apart is how seriously David Marusek takes the job of writing SF. It makes no attempt to apologise for what it is. Not to say that the novel is po-faced, or anything like that. He’s a good writer, there’s a decent level of wit in this. Instead, what I mean is that it’s a proper, serious SF novel. It never shies away from the fact that it’s SF; it has a lot of ideas in it and I’d guess that Marusek has read a lot of SF himself. He marries these sfnal themes with an excellent human drama, the characterisation in this is almost uniformly excellent. This can often, I think, be a weakness for a lot of ideas driven SF writers – that is to say that they are often not so good at producing characters who are anything other than mouthpieces for themselves. At the time that I’d picked this up, as it happens, one of the things that had attracted me was an online review (which was possibly for Mind Over Ship) which suggested that – in spite of the many ideas in Marusek’s work – he actually manages to avoid that bane of hard-SF, the info-dump. I can live with info-dumping in hard-SF, but it is a pleasure when someone is able to convey decades of technological and scientific progress without resorting to clunky prose explaining how their quantum-enabled-super-whizzy-bang-6000 is able to make toast across all possible universes. On March 30, 2092, the Department of Health and Human Services issued Eleanor and me a permit. The undersecretary of the Population Division called with the news and official congratulations. We were stunned by our good fortune. The undersecretary instructed us to contact the National Orphanage. There was a baby in a drawer with our names on it. We were out of our minds with joy. However, this practical immortality would seem to imply – in some ways – that the world is almost utopian. Things aren’t (of course!) quite so simple. It’s set against the background of a terrorist attack which has led to intense paranoia about nano-weapons – which imposes surveillance on the population and leads to Sam Harker’s downfall. He is “seared” a process which amongst other things separates him from his peers. He is now incapable of receiving the treatments he requires to stay young. So when the book moves into it’s second and third parts, he is an old man. Incidentally, the lack of info-dumping extends to the explanations around the society we find ourselves in. It’s clear that something happened in the past which went a long way towards shaping the society that we find ourselves in, but the author never finds it necessary to fully explain what it was. Further, despite the anti-senescence treatments, nano-tech and AI cores have clearly not led to a post-scarcity world. We, I think, mainly get the sense of this from the immersion that Marusek creates, rather than because he feels that he needs to explain it. The “searing” (and there are quite a lot of new terms in the book, though some are obvious and made more so by context, “aff, “homcom” and so on) was part of an attack on the growing power of Eleanor Starke (Samson’s wife). As the novel moves on, this is more pronounced. A crash leaves her and her daughter dead and severely disabled (only her head survives intact!) and the plot of the novel centres around a group of characters involved in its retrieval. If I were to criticise, I’d say that the ending does go a bit crash-bang-wallop, but it was fun getting there (much like the excellent film District 9, it did so well getting there, I’m willing to forgive it). In fact – and I know I’m not alone here – there is a sense that the pacing is slightly uneven throughout. To be scrupulously fair to the author, I believe that this may be because (as far as I’m aware) the first part of the novel was a stand-alone novella/short story at one point. Maruseks’ confidence is demonstrated through having a novel which features many SF ideas (immortality, AI, colony ships, intrusive total surveillance, nano-tech, anti-senescence treatments, altered family arrangements – and these are just the ones I’m thinking of several weeks after having read the novel) which a lot of authors would pick just one of these ideas to construct a whole narrative around. I enjoyed this a lot, and recommend it! This entry was posted in Review and tagged david marusek, novel, sf, usa. Bookmark the permalink.